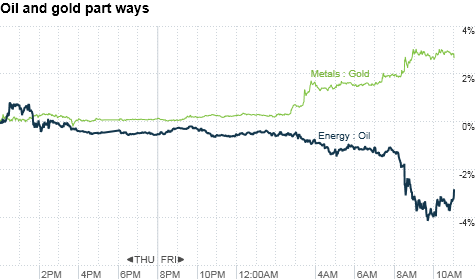 Click chart for more on gold, oil and other commodities. NEW YORK (CNNMoney) -- Fear about a lifeless economy drove traders to stock up on gold and offload oil Friday, after the government's big jobs report showed that hiring screeched to a halt last month. "The only thing you need to fear is fear itself, and primarily what you're seeing drive prices right now is fear," said Dan Flynn, senior market analyst at PFG Best. "There's just no confidence in the economic outlook, and that needs to change." Economists had been expecting a weak report given the recent debt ceiling gridlock, plunging consumer confidence and the downgrade of the United States' credit rating in August. But what they got was even worse than expected. A CNNMoney survey of 21 economists forecast that 75,000 jobs would be added last month, and economists typically estimate the nation needs to add about 150,000 jobs each month to keep up with population growth alone. Gold surged 2.6% to settle at $1,876.90 an ounce following the report, as traders sought out safe havens. Prices have soared more than 15% in the past month. Shares of the Spider Gold Trust ETF (GLD) and the iShares Comex Gold Trust ETF (IAU) jumped 3%. Silver also benefited from the economic distress, climbing 3.7% to $43.02 an ounce Friday. The iShares Silver Trust ETF (SLV) gained 4%. A weak U.S. currency has also added to recent gains in metals, said Flynn. Meanwhile, oil prices tumbled 2.8% to $86.45 a barrel on Friday. Crude prices have slid about 8% over the last month. The United States Oil Fund ETF (USO), which has dropped 7% in the past month, slipped 2.4% Friday. "Crude oil is looking at demand destruction right now," he said. "With a lack of people going back to work and economic data as a whole as it is, it's just not a supportive environment for higher prices." If the government finds a way to create jobs without having to introduce another round of quantitative easing, Flynn said the commodities market will likely settle down and stocks will head higher. "At the end of the day, we have no new jobs in the private sector being created, and we have to create jobs to see positive movement in commodities," said Flynn. "Until we see some economic leadership and get a course of action in place, we'll have more people buying gold and selling oil." And if jobs aren't created, the commodities market is in for more choppiness as uncertainty continues to reign. "I've been doing this for more than 30 years, and I've never seen markets trade like they have in the past month," said Flynn. "I've never seen this much doubt in the market since I've been in the business."